I'd like to thank DB10 and Arsenal FC for putting on that testimonial, because in doing so they brought back my 2 favorite footballers to Arsenal, even if just for a day. Seeing both Kanu and Vieira in the red & white again was pure sweetness - I wish I could have seen the whole match instead of just highlights on FSC. 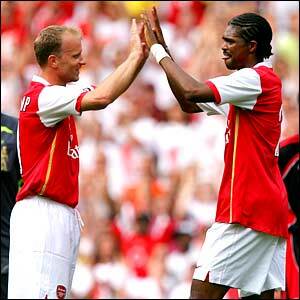 Kanu went so far as to score the gamewinner late on as Arsenal beat Ajax 2-1. DB10 & K25: like old times. The fact that Henry and Vieira each interrupted their short summer vacation to fly to London and participate, and that a bunch of Ajax/Dutch legends including Marco Van Basten and Johan Cruyff not only turned up but also played, shows how respected and well liked DB10 in the fraternity of footballers. If only he could have converted that final chance everything would have been perfect. After the match he spoke, did a lap of honor, and then was carried off the field by Henry & Vieira. 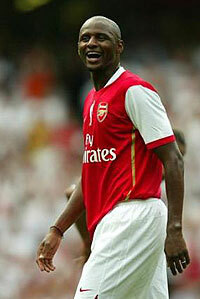 Speaking of Vieira, what a range of emotions he must have felt. Happy for his good friend, happy to see many of his old mates, etc. But it also must have felt pretty damn weird to wear the Arsenal kit again in the first match at the new stadium knowing that he is no longer at Arsenal and will not feature in all that may or may not come in the new building, especially after going to Juventus only to then losr to Arsenal in the Champions League and then see Juventus stripped of it's titles and relegated to Serie B. 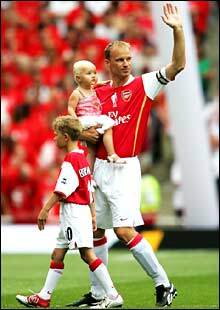 When he was named captain in 2002, there were 3 years when all people talked about was that PV4 would lead out Arsenal at the new ground; now it will be his good friend TH14 who will be doing that. Speaking of conflicting emotions, just seeing Paddy in the current Arsenal kit made me both very happy and sad all at the same time. "Joy and pain... like sunshine, and rain." By all account the new stadium is amazing - can't wait to see it on TV when the EPL starts back up in 4 weeks. 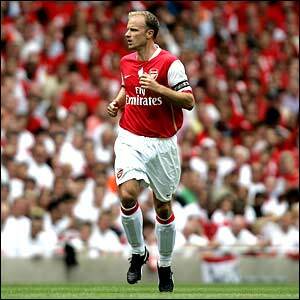 Thanks again to DB10 for all that he did for Arsenal; his importance to the club really cannot be understated. Take care & be well, Dennis.